After joining SLF in 1996, one of the first meetings I attended was with the superintendent of Salem-Keizer’s schools. Homer Kearns was meeting quarterly with pastors and ministry leaders to build relationships and avert discord. This was heady stuff back then … the CEO of Oregon’s second-largest school district meeting with clergy on a regular basis! Ministry friends in other cities could not believe ‘church and state’ would come together like this. Especially in Oregon. Over the years and through four more superintendents—Kay Baker, Larry McMurray, Sandy Husk and Christy Perry—the meetings have continued. In fact, Supt. Perry has kicked it up a notch. Instead of meeting three times a year at District headquarters, Christy has us out in the schools. Last school year we met at Cesar Chavez Elementary and two middle schools: Houck and Judson. This year Christy wants four meetings, starting at Walker Middle School on Oct. 4. During our meetings, one of the regular topics is: “How can churches help our schools?” When we were gathered at Houck, the principal, Suzanne Leonard, said “we could really use a beautification project like they do at Walker every year.” In the audience were Craig Oviatt of Salem Dream Center and our trusty West Salem Lightning Rod Dwayne Hilty, both of whom rock the Walker event. They immediately pledged to coach anyone who might step forward for Houck. Two hands immediately went up: one was Tim Davis and the other was Imani Hall. Tim is a pastor at Church on the Hill, one of the 60+ ‘CaN Center’ churches that serve neighborhoods across Salem-Keizer. Church on the Hill birthed a music-and-mentoring ministry that has grown into its own nonprofit called Brothers of Valor. Men from several churches have banded together to provide mentoring in academics and fine arts from a home base at First Presbyterian Church downtown. Imani is our new North Salem Lightning Rod and he’s doing a fantastic job. 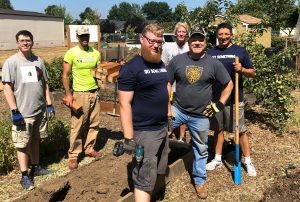 Imani, Tim and Jon Watts pulled together a team of 35 volunteers in August to paint the Houck Library and rebuild the infrastructure for the school’s community garden. Just one of many examples where churches are helping our schools. The door is wide open to serve. All of our schools are eager for church partners. And for 22 years our superintendents have been saying it’s OK. Are you in? Enrichment Academy at Straub Middle School with Salem Keizer Education Foundation (SKEF). Supporting the West Salem CaN Centers by working with churches through out West Salem. Grass Roots After School Soccer (GRASSP) Program in 10 elementary schools on the East side of town. We will be expanding the program to West Salem beginning Spring of 2019. I moved back to the United States in June 2018 after living / working in Jakarta, Indonesia as a teacher and school administrator for 18 years. I was born and raised in New Jersey and spent a bit of time in Oklahoma to attend University and to begin my teaching career. Although family are still living in Oklahoma, I’ve followed God’s leading to Salem because of connections with friends… and for the mountains, lakes, rivers, trees and BEAUTY of the PNW! 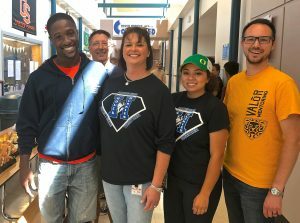 While visiting the States in March 2018, I was introduced to Salem Leadership Foundation as I helped serve at the Community Homeless Connect. I was drawn to the vision and mission of SLF… such a big purpose, big heart and great work! What a privilege it is to now work as SLF’s CaN Coordinator and to serve alongside the AMAZING, BEAUTIFUL SOULS of the SLF staff, the many churches and community members as we endeavor to bring health, healing and hope to the children, families and neighborhoods of Salem- Keizer! Carrie Maheu just recently retired from active duty with SLF after 11 amazing years as one of our original Lightning Rods (field staff) … but she is still very involved in neighborhood initiatives through her church and as an SLF Ambassador. In 1976 Carrie moved to Salem where she met and married her husband Michael. Their daughter Katie attended school in Salem and graduated from McKay High in 1995. They have attended the Salem First Free Methodist Church for 22 years where she serves as the CaN Center Director supervising free after school programming – with a focus on Neighborhood Outreach. Carrie enjoys being a part of the Community her past and current affiliations are: McKay Area Coalition for Student Success (MACCS), CaPES/McKay CPT, No Meth/Yes Foster Care Campaign, Reading for All Initiative, Fostering Hope Initiative, Coordinator of the East Salem Community Dinner, Friends of La Casita and Community and Partners of East Salem (CaPES) Treasurer. During her previous career in retail management she served as a Softline Manager, Corporate College Recruiter, Administrative Assistant and Regional Competition Price Coordinator. Her favorite thing to do is babysit her grandson. Born and raised in Salem, OR. Daughter to Steve and Lizi, older sister to Janzen. She moved to Eugene in 2011 to pursue her bachelor’s degree in international studies and non-profit management from the University of Oregon. Moved to Buenos Aires, Argentina in 2014 to work with a non-profit focusing on sustainable development and sustainable building called Chacras de Buenos Aires. Graduated from the University of Oregon in 2015. Moved to France upon graduating to learn French to further pursue her dream of working for the United Nations. Moved back to Salem in the summer of 2016 and worked as CPT Coordinator for Salem Leadership Foundation and part time as a substitute teacher for the Salem Keizer School District. In 2017, Z headed to Boston for her master’s degree, which will get her one step closer to her goal of working for the UN. Z is back for the summer at SLF, serving as our Interim CaN Centers Coordinator. Texas Native, who moved to Salem in 2008. Graduated from Corban University in 2011. Husband to Kristine Herring since 2011. Has three sons, James Dean, Jordan Kent, and Jackson Cole. Attends and serves at the Salem First Free Methodist Church. On staff with SLF as full time Lightning Rod since 2015. My favorite part of the neighborhood is smelling the fresh baked bread as I ride my bike past Miranda Bros Bakery on Lancaster. • After School Programs at Salem First Free Methodist Church. • Partners and Coaches for Grass Roots After School Soccer Program, GRASSP. • Co-Chairs Communities and Partners of East Salem, CaPES. • Parks Co-Chair for North Lancaster Neighborhood Association. • Supports the McKay Area CaN Centers: Salem First Free Methodist, Calvary Chapel Salem, New Hope Foursquare, Holy Cross Lutheran, Grace Community, New Harvest. I was born in Philadelphia, Pennsylvania and grew up just outside of the city in Upper Darby, PA, graduating from Springfield High School in 2012. After graduation, I attended Ithaca College where I majored in Environmental Studies, minored in African Diaspora Studies and was a part of the Martin Luther King Jr. Scholarship Program. A scholarship program which focuses on social justice and the teachings of Rev. King. This program equipped me to critically assess matters of inequality and oppression. Through this program I was blessed to travel to Accra, Ghana, and London, England. Personally, I studied abroad in Auckland, New Zealand. I came to Oregon through the Resource Assistance for Rural Environments (RARE) AmeriCorps program, managed by the University of Oregon’s Community Service Center. While in the RARE program, I served in Independence, OR assisting the Independence Downtown Association and the City of Independence in revitalizing its downtown. It was in this role that I met former Salem Leadership Foundation’s board member Gregg Peterson, owner of the Independence Grill, and Sam Skillern (SLF Executive Director). Together they encouraged me to apply for a staff position at SLF and help the ministry expand its capacity to serve Salem. As a Lightning Rod in North Salem, I’ll be shadowing Sam Skillern to learn about the Salem community and build relationships in North Salem, growing to facilitate more relationships between people of faith and people of good will in the North Salem high school feeder area. First and foremost, I get to be Aaron’s wife. We have two boys, Andrew & Jonathan, and they don’t fall far from our tree: they love reading, music, adventures and laughter. I originally came to Salem (from Kauai, HI then Pacific City, OR) to study and play at Willamette… and I haven’t left this great city! My undergraduate and graduate degrees are in Exercise Science and teaching, and while I use them seldomly, the Willamette experience has been invaluable. I held a teaching position at Stephens Middle School (2003) for 10 wonderful years before I “retired” to do youth ministry and media work at Calvary Chapel Salem (2013). From there, I transitioned to Salem Leadership Foundation (2017). My work as CaN Centers Coordinator at SLF is continually widening my view of this incredible city, the churches and brothers & sisters that serve it, and the one true God who loves everyone. Husband to Marsha Boes for 49 years. We have four adult children and eight grandchildren. I’ve been a Salem Leadership Foundation Lighting Rod Associate since 2007. Husband to Julie for 17 years with two children (Riley 13 and Logan 10). I moved to Salem in 2004 as part of a church-planting team in South Salem, and then moved to West Salem in 2008 to pastor Soma Church. I started working at the Salem Leadership Foundation as West Salem Lightning Rod in 2015. I was born and raised in Seattle Washington. I grew up in the Richmond Beach neighborhood, North of Seattle. I have a Bachelor of Science in Clothing and Textiles from Seattle Pacific University and an Associate of Arts and Science from State University of New York/Fashion Institute of Technology in Advertising and Journalism. Sam and I moved to Salem in 1996, answering God’s calling for Sam to be the Executive Director of the Salem Leadership Foundation. Sam and I have been married for almost 30 years. We have two college age sons, Samuel Charles IV, & Andrew McLean. We currently worship at Salem Alliance Church and live in a 100 year old home in the Grant Neighborhood. We are passionate about neighborhoods, advocating for the underserved, servanthood and old house restorations. I have been on staff at SLF since June of 2015. Married to Jerry Dolar, and we have two young adult children (Josh & Laura). Originally from Montana, but have lived in Salem since 1992. I live in the South Gateway Neighborhood, our kids attended schools at Sumpter, Judson and Sprague. I worked as Parish Administrator at Our Savior’s Lutheran Church in South Salem for 12 years. I volunteer with Interfaith Hospitality Network, Battlecreek Elementary, and SKIT theatre. Enjoy playing the piano, hiking, family reunions, and OSU sports! •	Chair of South Salem Connect (SSC) a Community Partnership Team (CPT) increasing neighbor livability through partnerships, one time projects and weekly programs. •	Team leader at Leslie Middle School and monthly events coordinator for Salem area Wyldlife. •	Founder and leader of the Salem Missional Community Network seeking out the broken and marginalized through forming families of missionary servants. •	President of the Co-Active Connections Board supporting its work to educate and advocate to promote awareness of the poverty experience. •	Poverty awareness coach and volunteer trainer for Community Connect, Salem Warming Center, and the annual Homeless Count. •	10 year board member with Isaac’s Room supporting their work to help divested youth rise to the challenges of life through the IKE Box, IKE Quest and IKE House. •	Supporting the South/Sprague CaN Centers: Emmaus Community Church, Capital Park Weslyan, Our Savior’s Lutheran Church, Trinity Covenant Church, Morningside United Methodist Church, and Gateway Foursquare Church. Sam Skillern is the executive director of the Salem Leadership Foundation, a faith-based community-impact organization that was founded in 1996. SLF is well-known for its work building bridges between the faith community and the community at large, especially schools, government, business, the human services and law enforcement. SLF is also active working across the denominations and between different religions, helping people-of-faith practice the Sacred Art of Servanthood, as modeled in the ministry of Jesus. SLF is a strong partner in the Churches as Neighborhood (CaN) Centers Project, the Interfaith Hospitality Network, Fantastic Fridays at Grant School, Reading Buddies at Highland, the North Neighborhoods Community Project Team (CPT), and the Marion County Children and Families Commission, among many other initiatives. Sam is a Salem son who graduated from South High (1977) and Oregon State (1982) before heading to Seattle for a 14-year career in consulting and community-building ministry. Sam and his family live in a historic 1916 Crafstman home and worship (Salem Alliance Church) in the Grant neighborhood of north-central Salem, which is also the location of SLF’s offices. Sam serves on the Marion County Children & Families Commission and chairs both the Grant Neighborhood Association and the North Neighborhood-N2 Community Progress Team (CPT). In March 2005, Sam was honored with the Distinguished Service Award by the Salem Chamber of Commerce and City officials.